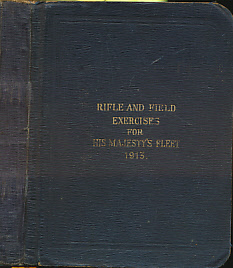 Barter Books : Admiralty : Rifle and Field Exercises for His Majesty's Fleet. 1913. B/W plates, one fold-out, and line diagrams within text. 140 x 120 mm (6 x 5 inches) - xix, 330pp + plates. G: in Good condition without dust jacket as issued. Cover rubbed and edgeworn. Bookplate on pastedown. Front inner hinge cracked at base. Soiling to eps.